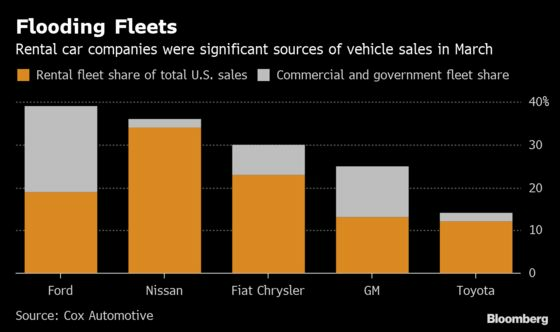 (Bloomberg) -- Stronger-than-expected new-car sales last month belied a dirty little secret: Automakers have been selling more vehicles to rental fleets in recent months to prop up volume. Automakers sold 550,000 vehicles to rental-car companies in the first quarter. That’s the most since the first quarter of 2016 and up 6 percent so far this year, Rahim said. The increase comes on top of a 7 percent gain in 2018 to 2.7 million. Ford was especially reliant on fleets in March, with these deliveries accounting for 39 percent of sales, including 19 percent from rental-car companies, according to Cox data. The automaker is discontinuing car models including the Focus compact that used to be significant volume contributors. 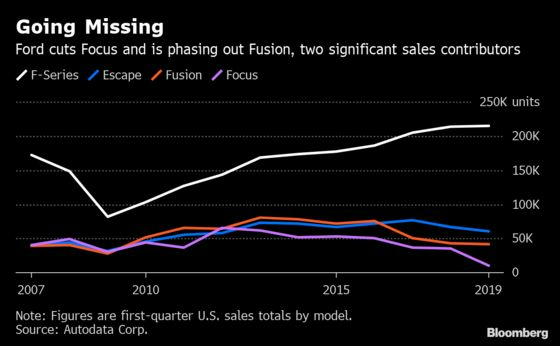 Mark LaNeve, Ford’s U.S. sales chief, said the first-quarter jump in fleet deliveries was dictated by the timing of orders from rental companies. He expects these sales to smooth out over the course of the year. Nissan’s total fleet share was 36 percent. Most of that volume went to rental lots, the data showed. A Nissan spokesman said the company doesn’t break out its monthly sales.